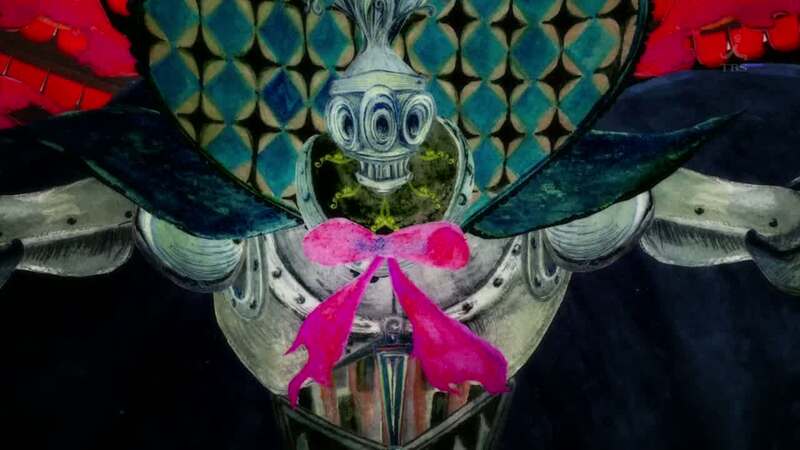 We learn the truth about Homura, how this is at least the 5th time loop she’s in, in her desperate attempt to save Madoka. However, she still can’t defeat Walpurgis Night on her own, and in an attempt to save Homura and all other magical girls, Madoka makes the wish to erase all witches from the past and future everywhere in the universe before they come into being. The price for Madoka’s wish is that she essentially becomes god, and is omnipresent everywhere at all times, meaning that no one can sense her presence, except for Homura, probably due to her ability to manipulate time, and for some reason Madoka’s younger brother Tatsuya. Evil isn’t eliminated – witches are replaced by demons formed by some unknown means, and magical girls whose Soul Gem becomes too corrupted simply die instead of becoming a witch. 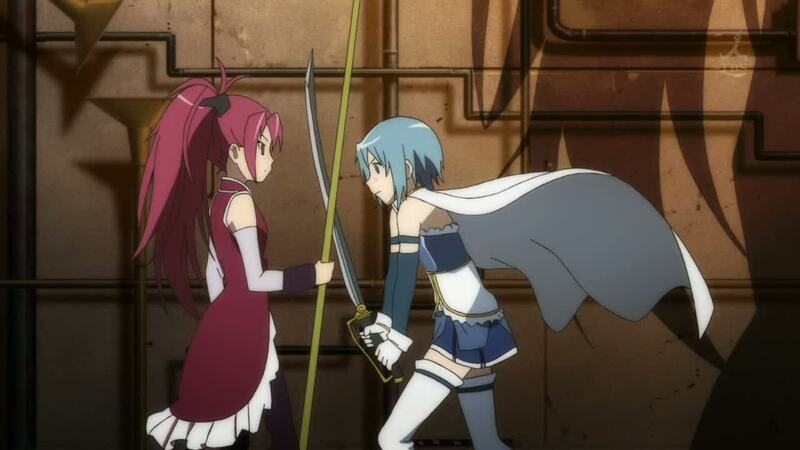 It appears like that magical girls that died fighting witches, such as Mami and Sakura were revived, but magical girls that died or became witches via other means, such as Sayaka, couldn’t be revived (or at least, still died via some other means in the altered universe). This certainly was a new and creative anime series, at least for me. It took a concept – that of the magical girl – and basically turned it on it’s head by making becoming a magical girl almost entirely negative. One’s wish in order to gain magic almost always backfired, and then they eventually turned into the very witches they fought against. And the makers of the series didn’t decide to take some easy way out either, even though they probably could have with Homura being able to time travel. Even if Madoka is content with her sacrifice, it’s still a rather sad ending – if one could call becoming something of a god a sacrifice. It doesn’t seem like she is all-powerful, just omnipresent, kind of like being a ghost, except existing everywhere at every time. Perhaps my only criticism of Madoka’s wish was that she didn’t wish for magical girls to not exist at all. If the magical girls didn’t exist, then the witches wouldn’t either. Maybe she didn’t do that because she agreed with what Kyubey said, that without the magical girls, human civilization may not even exist, so magical girls still had to exist, they may still despair and die, but they wouldn’t turn into witches. I think there are other causality problems as well. Would Sayaka really have become a magical girl had Madoka not existed? Would any number of magical girls become so with witches having not existed. Hell, would Homura become a magical girl without Madoka existing? I suppose there is a timeline where she still would have become one, or maybe she is still one because she was insulated from the changes due to her own magical powers. Kyubey (I think) also mentioned that he doesn’t have the power to bring back the dead (which seems to be the one limitation to his power) which is perhaps why anyone who died before can’t be brought back now – though it seemed like Sakura and Mami were back, so that doesn’t really explain it, unless they were brought back only because they died fighting witches, which no longer exist. There are still contradictions. Are they enough to sour the show? No, I don’t think so, but I thought I would still note them. I’m not sure I would go as far as saying this was one of the best series of all time, like what it’s rating on MAL suggests, but it was certainly pulled off well. You got drawn into the characters and cared for them, even characters like Sakura who initially you never thought you could like. I perhaps didn’t get as emotionally attached as I otherwise might have, since I watched this over the course of two days instead of 3 or 4 months, but I still thought the ending was touching. The storytelling was great, revealing just enough bits and pieces to keep you interested, but not revealing the whole story until well into the show. 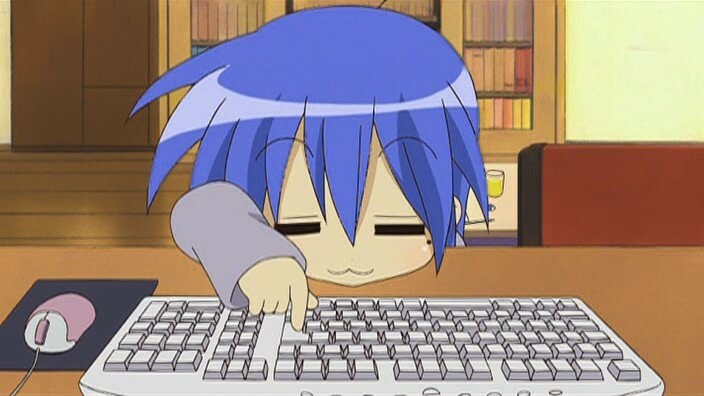 That on top of what I said above – turning the genre on it’s head and not doing the “everyone is happy, yay!” ending does make this a show worth watching. One’s heart kind of sinks knowing that Madoka is basically removed from the world, and her friend Sayaka still isn’t saved, but sometimes winning just isn’t perfect. So we finally discover the full truth behind the magical girls: It’s a process used by Kyubey aka. The Incubator in order to gather energy from the emotions from teen girls in order to prevent the heat death of the universe. As a result, all magical girls, eventually, become witches, and when that happens, Kyubey can gather their energy. He is so intent on having Madoka become a magical girl because, with her latent power, she would provide an extraordinary amount of energy toward Kyubey’s goal. 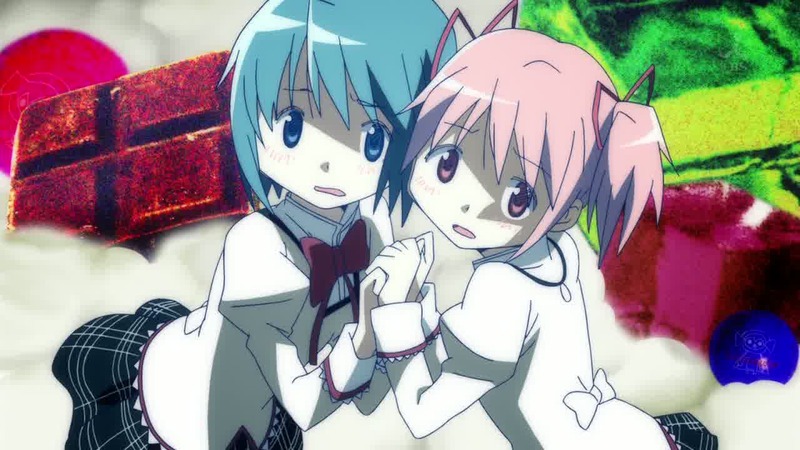 As Sayaka and Homura noted, balance in the world has to be maintained, which means that the wish that is granted has to be repaid via an equal amount of negativity in that world, which is accomplished by the despair of the magical girls and the curses they cast once they become witches. The bigger the wish granted to become a magical girl, the more curses they cast as witches. While Kyubey may have seemed cute and innocent at the start, it’s now clear he’s just using humanity to further his own goals, even going so far as to mislead Sakura into believing Sayaka could be saved, resulting in her death, putting Homura and Madoka in the position where, the only person who can save the city from Walpurgis Night is Madoka if she turns into a Magical Girl. If he can’t trick her into becoming a magical girl, then he’s going to try to coerce her into it by threatening everyone she loves with destruction if she doesn’t. Speaking of Sakura, she’s come off as a bit better character in these episodes. In a way, she and Sayaka aren’t very different: they both made wishes to help others, only to have those wishes turn against them. Sakura decided to turn her despair into a philosophy of doing things only for herself while Sayaka just gave up and became a witch. In any case, as Sakura mentioned, the only time becoming a Magical Girl makes sense is if you have nowhere else to turn, such as when she was living in abject poverty or when Mami used her wish to save herself from death. As for Homura, she appears to know everything because she’s able to use time manipulation. Whether that means she’s able to go back in time and “start over” whenever she fails, I’m not sure. All we know is that she’s from another timeline. She may not be able to go back in time within the same timeline, though she is able to pause time. One would think this will eventually come into play again in the final three episodes. 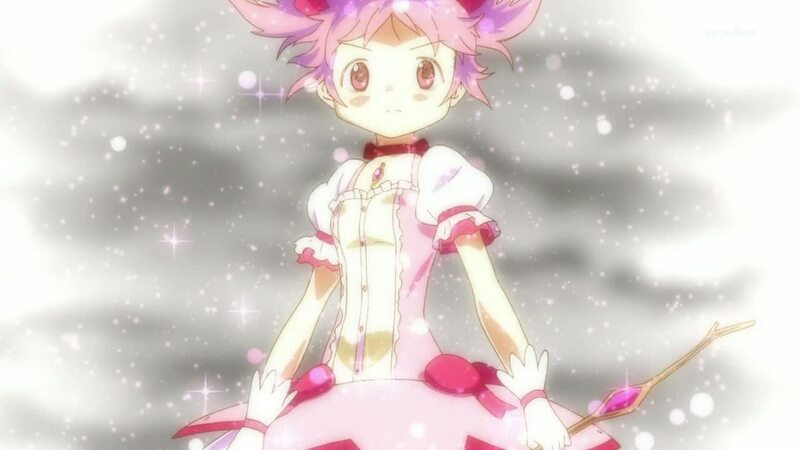 It seems likely that Madoka will eventually become a Magical Girl under some circumstances. For example one wish that was suggested by Kyubey (even though he said he couldn’t make suggestions before) was for her to become an omnipotent god. Perhaps with such a wish she could avoid the heat death of the universe herself, and perhaps change her fate of becoming a witch that way. It’s becoming pretty clear that things aren’t all that they seem. Sakura, who appears to have been a Magical Girl for a while, had no clue that her soul was contained not within her body but within her Soul Gem, and she wasn’t particularly happy with it either. It’s clear that, despite the straightforwardness of the initial deal (any wish in exchange for becoming a magical girl), Kyubey isn’t telling the whole story to potential magical girls when he asks them to become one. And if he didn’t say anything about this, what else might he not be saying? His nonchalant attitude toward not revealing the whole truth, and his annoyance at the girls’ reactions when he does is also rather disturbing. Sayaka has become quite hostile since becoming a magical girl, though I can’t particularly blame her in Sakura’s case, since she clearly is fine with witches killing people just to increase her own power. However, now that some things have been revealed to her, I wonder if she’ll be a little less gung-ho about it. It’s obvious that Homura knew the nature of the Soul Gem, which makes one wonder what else she might know. She doesn’t seem particularly keen on sharing, though, at least for the moment. She seems mostly intent on Madoka not becoming a magical girl, which appears to be becoming a wiser and wiser choice, despite Kyubey’s increasing pressure for her to become one whenever Madoka feels helpless. There was a lot about regretting becoming a magical girl in episode 5. I’m wondering if Sayaka will start regretting that decision soon the more she learns what it actually means. Also, I’m wondering if Homura’s wish had something to do with being all knowing. She knew Kyubey was going after Madoka. She knows people’s names even though she just met them. She seems to be very knowledgeable about all the subjects at school She seems to know an awful lot about the nature of the magical girls, and what not. She clearly doesn’t know the future, since she was as shocked by Mami’s death as anyone else, but she seems to “know” more than you would otherwise expect. This is the first of three new series from the winter and spring seasons I decided to go back and watch after the fact. The reason I picked this one was largely from all the hype I read about it on twitter. And, heck, it’s currently the #13 anime listed on MAL, so I thought I would give it a shot. Despite my love for some other Magical Girl shows (see: Cardcaptor Sakura), my experience with other shows of that type have been less than stellar. I’m also skeptical of the loliness of some of the characters in the show art. However, I’ll give this show a chance. This series is certainly starting a lot darker than I was imagining it. Most Magical Girl series seem pretty pretty cheerful. Sure, they face dangers and all, but you usually don’t see one of the magical girl buddies getting her head literally bitten off. This series is also different in that, usually the magical girl will become the magical girl in the first episode, and then go off and do their magical girl thing. In this case, it is almost like the series is about Madoka’s (and Sayaka’s) trips toward becoming magical girls (or not). Both girls were hesitant about becoming magical girls to begin with since neither could really think of a wish to risk their lives over, and I would have to think that just became more of the case after the death of not just a magical girl, but their tutor Mami, happened right in front of them. Homura’s attitude also seems to be from more than just not wanting rivals, though I suppose that could just be her personality. We still haven’t found out what she wished for when becoming a magical girl yet, though.